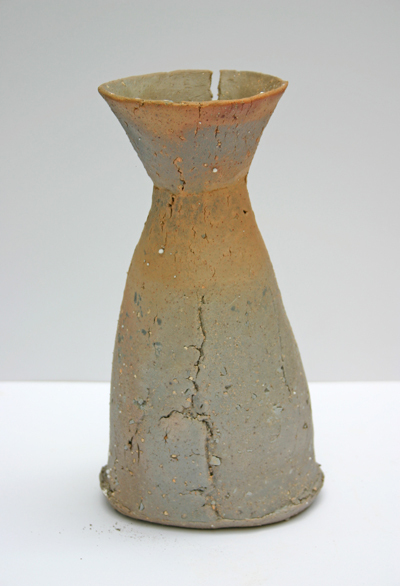 some exciting results from the saggar firing. lots of greys and browns, rusts on the terracotta crank and even boring old potclays crank has a lovely roasted rust (top of pot in centre), and some really interesting markings. all that remains of the sawdust is the brown crumbs on the shelf. 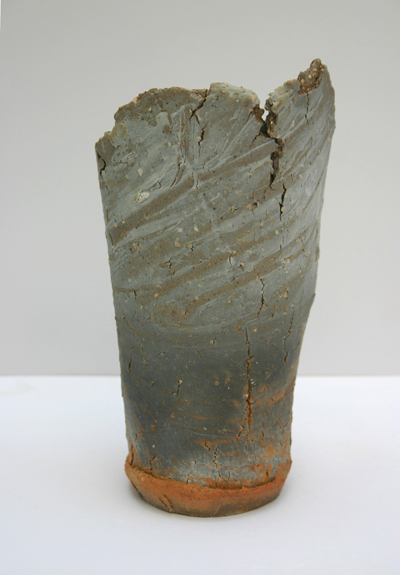 I have lots more pots that are going to benefit from this treatment, and the ones that were just glazed and fired normally on top of the saggar look rather anaemic. I am going to refire some of them in the sawdust saggar. frustratingly I don’t have enough shelves for this. 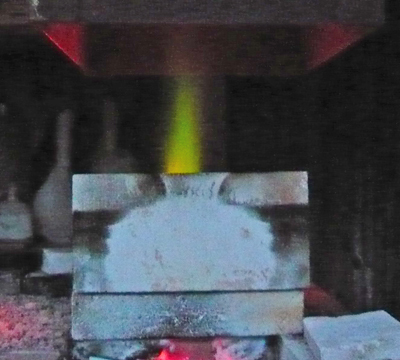 but after Sebastian Blackie’s very helpful comments and a further correspondance, I think I could do this with some cardboard saggars using a different slip, in the part of the kiln away from the flame, and use saggars made of kiln shelf in the side next to the flame. on further thought, I do have four silicon carbide shelves which will just squeeze into the kiln on their sides, so provided they stay upright I can make a super saggar which contains the whole of the kiln. 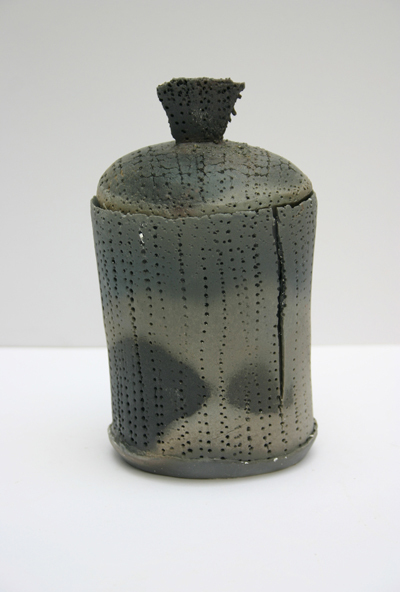 and if Sebastian Blackie’s saggars work without lids, because really they just hold the sawdust in place around the pots, there is no reason why this should not work without a lid. which means I can get my tallest pots into it. which is very exciting. 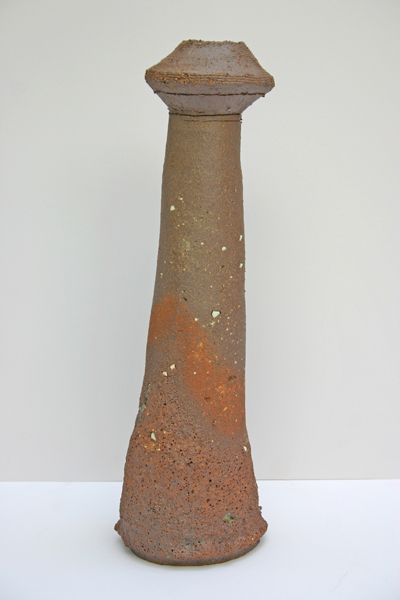 I have several kiln loads of tall pots which were going to be fired in Nic Collin’s hogback anagama, but in fact the results I am getting by saggar firing are much more suited to my work than Nic’s highly-ashed anagama firings. 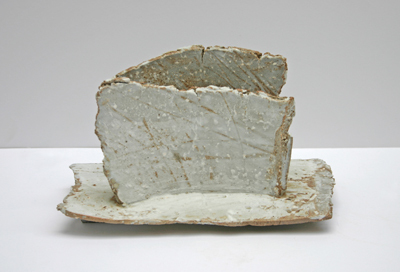 in the event, the silicon carbide shelves turn out to be too thin to stand on their sides safely, and I use the same shelves as for the first firing with ceramic insulation board for the top half. 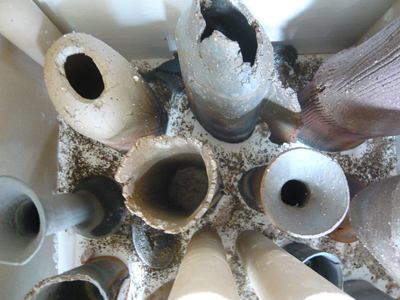 and the usual cones to check through the spyhole/extractable brick, except that they are a brick lower than usual as the only place to put them was perched on the edge of the shelf, and goodness knows what the temp will be outside the saggar box next to the front here. 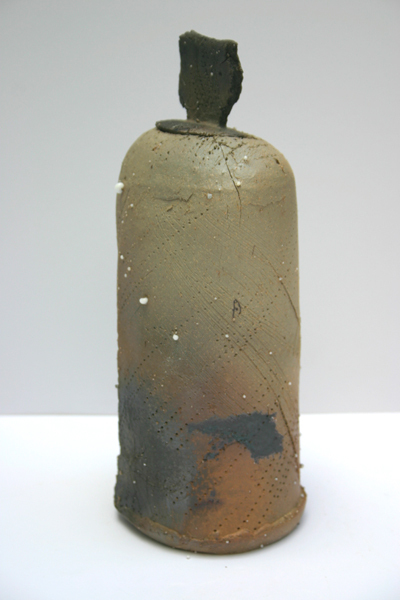 of Monday’s� firing, I will post again later when I have all the photos up on a web page. 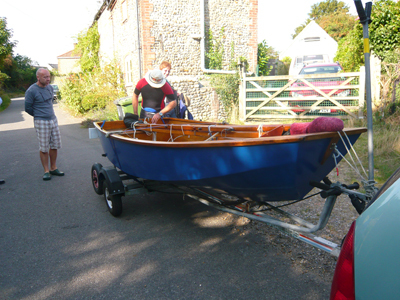 an exciting event this morning – my bid-for-on-ebay sailing dinghy arrived, complete with trailer, life jackets, and everything else one needs to take oneself off to Morston and pootle around in a boat. sadly I do need a few sailing lessons before I will actually be able to do any pootling. she is Mythos, number 7977, vintage 1967, a Mirror, designed by Jack Holt and Barry Bucknall to be made from plans given away by the Daily Mirror newspaper in return for tokens, built mostly of plywood. a classic snub-nosed pram dingy which one person (an experienced person) can handle with ease. 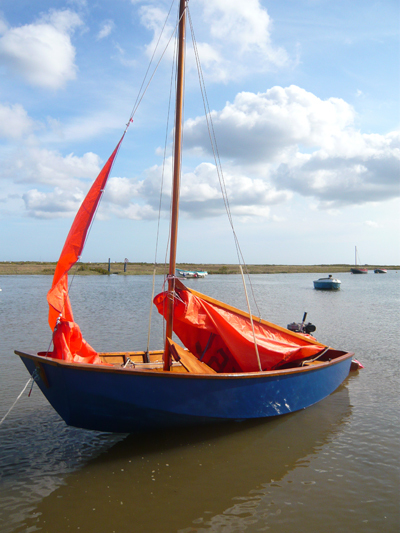 we took her straight down to Morston for a trial sail. the launch trolley worked very well, except for a tendency to float, but I think it might be too much for me to manage on my own. here she is, just launched. MM’s skipper took the helm and we sailed her out, myself squeezed into the front of the cockpit just behind the mast. there is really only room for two small people or one larger. she went very well, we were most circumspect, although we managed to go aground on the marsh as there was a huge tide and about a foot of water over the saltings, and then going back into Morston had to face oncoming wind, oncoming tide as it all gushed out down the channel, and a seal ferry full of people which was not going to give way to us about every two minutes. after a lot of tacking which got more and more difficult with a gusty wind constantly changing direction we got the little outboard (on loan) going. but even then progress was so slow against the tide that I had to get out at the cockle pontoon. she is covered in a tarpaulin in the field behind the house for the next few days. Morston was so chaotic today that it seemed more sensible to bring her back and then make a decision about where to keep her for the next month or so. the car park was full to busting and there were coach loads of people arriving for seal trips, fishing for crabs off every available jetty or bridge, launching huge great motor boats – even the police were there with a boat. 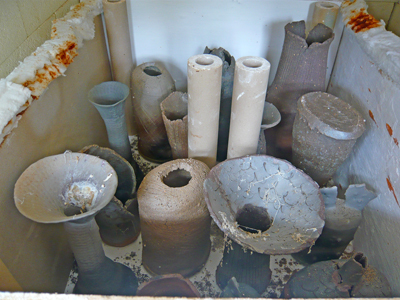 this is one of the shelves-full of charred cardboard saggars I extracted from the kiln on Saturday. 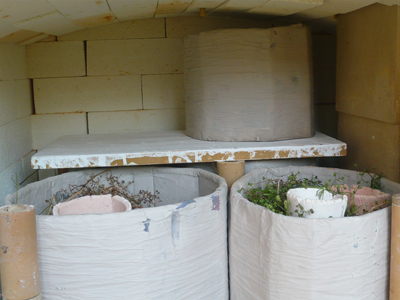 and more shelves for a lid, sitting on props so that the rest of the pots can go on top, glazed as for a normal firing. 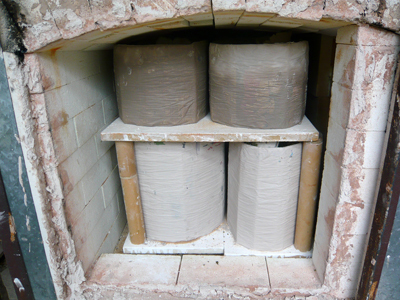 I fired the kiln yesterday as my normal firing, up to cone eleven about one third bent over, and we shall see what the result is tomorrow. it’s that time of year again, when a fashion designer turns to selling Spring 2010. I took the photos of the collection on Friday, thanks to the presence of Sid in Norfolk. in fact I didn’t make a very good job of it, we used a corner of my neighbour’s new kitchen (old forge) and the light wasn’t even, which I didn’t realise until I had downloaded the photos onto the computer, so in a lot of them Sid’s head is much darker than the lower part of the cardigan. I discovered some bits of photoshop that I had never used before. this is one of the worst examples, even after treatment. this design came straight off the guardian website, a series of underwater photos, I love the bobbly embroidery (bullion stitch) which represents the coral. I would have quite liked it without the fish actually, just a random abstract texture pattern. 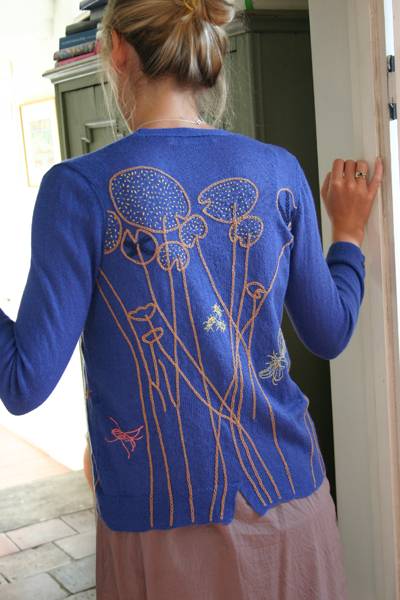 this colour seems popular, its in the cotton cashmere mix which is so light and dry. very pretty but not to my personal taste; then the collection is not designed for me. is fun and elegant at the same time, I think. 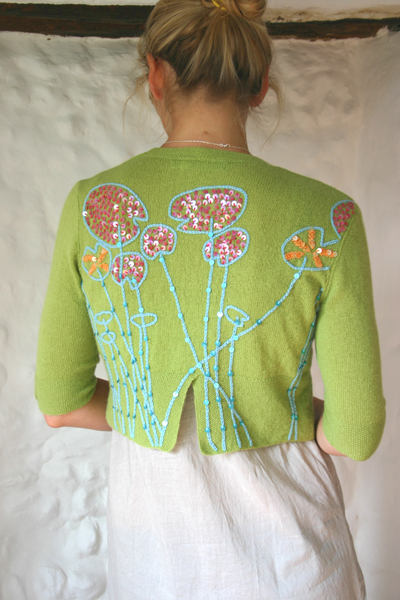 this is a similar design, a little less graphic, with sequins added. I found some linen ribbon for the tie, as the yarn is a linen cashmere mix. for the design I took the photo of fig branches against the sky into filter onto photoshop and chose stylize, with glowing edges. this gave thick white lines round the edges of the shapes and some interior contours of neon blue and green. perfect for an embroidery. you can see it better on the other sample with the grey background. then� inspired by my natural swimming pool, we have Pond Life – dragonfly, whirligig beetles, giant lacewing, and a pond skater. that was fun to do, I drew the creatures from my readers digest flora and fauna book. I have rashly bought three dark colours in the cotton cashmere (which has almost doubled in price since last year) this dark brown, a chestnut brown, and a dark conifer green. it will be interesting to see if anyone buys it. the handle of the yarn is so nice, and its good to have some dark colours in a very light weight yarn I think. also inspired by my pool, an image of waterlilies that I pinched off the internet and drew into. I love this one with the sequins, its fun and very striking colours. then of course I had to put the pond life and the waterlilies together. 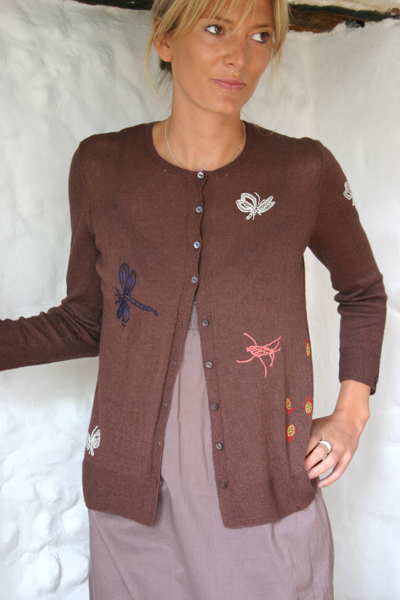 back to more classic things; this is a version of a traditional shetland lace stitch, flattened out to make an elegant cardigan. 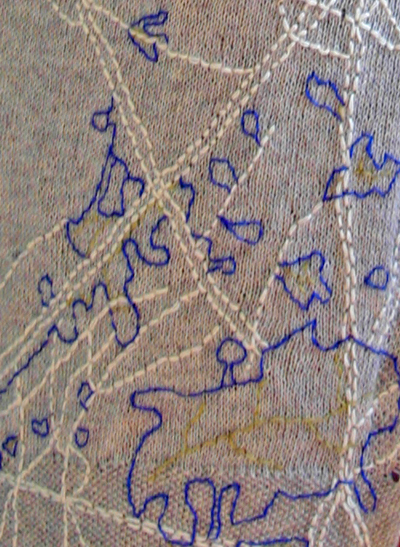 most shetland lace stitches are based on all knit rows, but this produces a more 3-D construction. on a stocking stitch base the stitches lie flat and fall better for a cardigan. again in the cotton cashmere yarn. I thought it would be good to have sequins on this very dry handling yarn too. just on the fronts of some of my shapes. this is the most adventurous, with its baggy little pockets. and this rather military looking one – in fact its the usual forage cap shape squashed down into a flat topped cap. 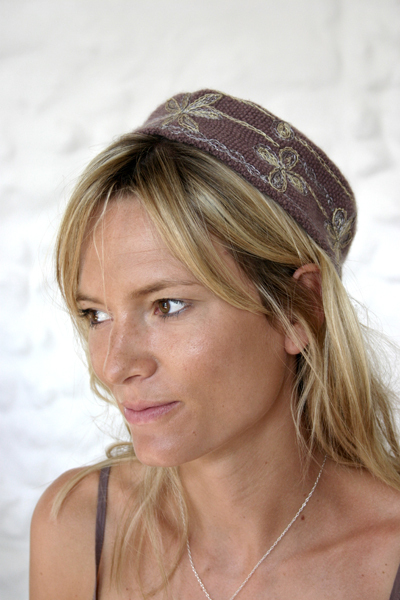 I love the pretty metallic crochet imitating military braid – “scrambled eggs”. 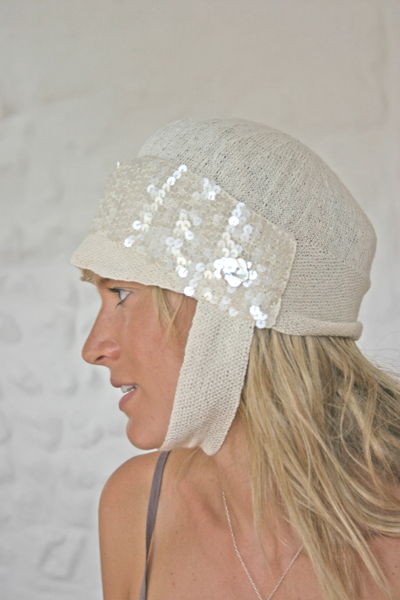 and attaching the wide chinstrap to the same shape hat� puts it straight into hollywood medieval. 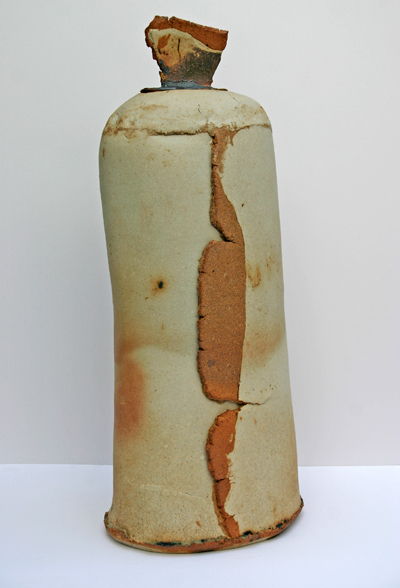 as I am missing the week of anagama and other wood firings at Nic Colin’s workshop in Devon this week, I have been left with a large number of pots which need firing in some more interesting way. it occurred to me to try Sebastian Blackie’s cardboard saggars, described in his book, Dear Mr Leach. 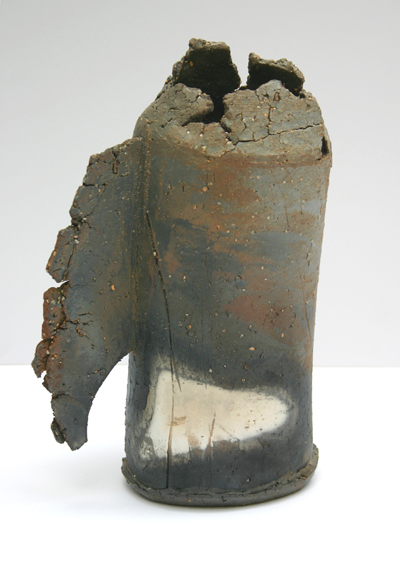 fifteen layers of newspaper and clay slip over a cardboard cylinder will last ten firings up to 1300 C, apparently, and unlike most ceramic saggars, which are enclosed, with a lid, and protect either the pot inside or the kiln from an atmosphere contaminated with carbon, fly ash or salt and other chemicals, these only partially enclose a packing of sawdust around the pot, which carbonises and should produce pots with black lower halves, and a certain amount of fly-ash glazing on the exposed part. 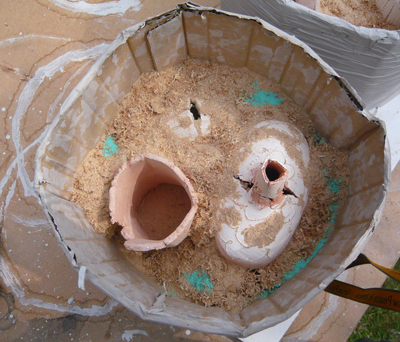 cardboard saggars take� less fuel to heat up, and less room in the kiln than a traditional clay saggar. 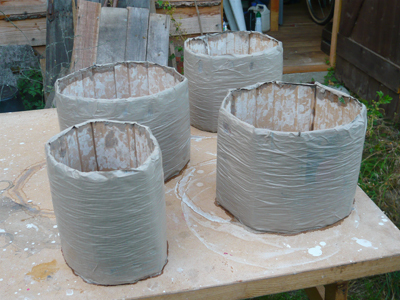 I have spent a couple of days making saggars, getting covered in clay slip. 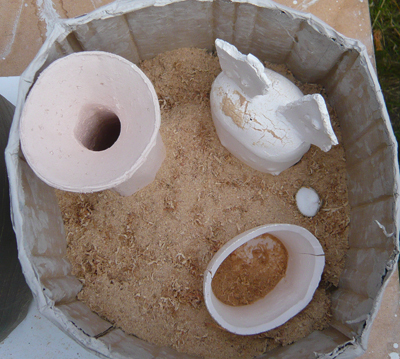 the sawdust is oak, from a friend’s wood workshop; she is making an oak kitchen� for my neighbours. once they were made, packing the pots was a quick process. 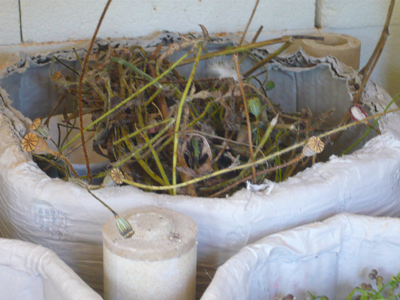 as well as sawdust these four had bits and pieces of� vegetable matter from around the garden – dead field poppy plants, goosegrass, that sort of thing. 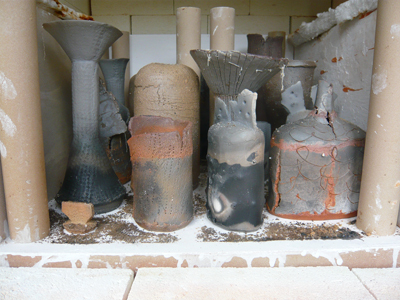 I have a feeling that no trace of them will remain on the pots after firing, but it’s interesting to try things. the shelves fit over these saggars fairly tightly, so they are almost like a regular enclosed one. the next batch on the top layer are quite close to the kiln roof, and I had to pack the shelf and then load the shelf in with everything in place, which was not easy. 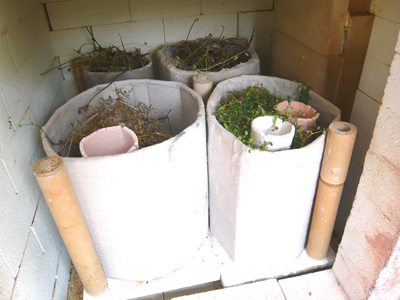 although the pots on the bottom layers are sitting directly on the kiln shelf, I decided to pad the pots at the top, which meant that the saggars could not just be slid across the shelves with their contents. 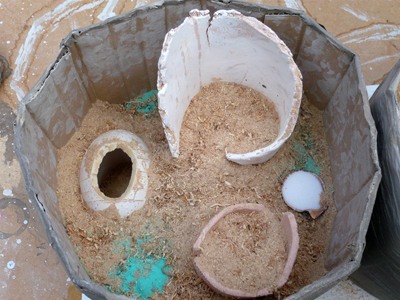 it did give me the chance to photograph the arrangement of pots and sawdust. 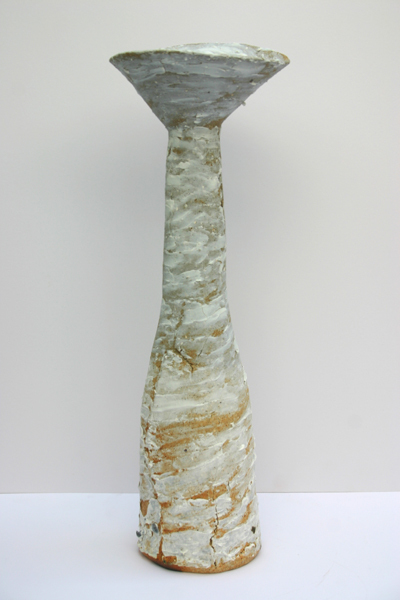 this one has copper carbonate sprinkled over the sawdust. and there is salt in the little shell. that will produce a little more glaze around itself. front right has both, front left has some steel wool. both shelves in with some sweaty effort, not as bad as if the lower saggars hadn’t been quite stiff and supported the shelf in the points in between the supports. now to fire it. Blackie says that he soaks at 500C for an hour, and then at 1300C for three hours, crash cools to 800C by opening the kiln door! I certainly am not doing that last part, it would set my shed alight, if I had a door to open, and I don’t, so I can’t. 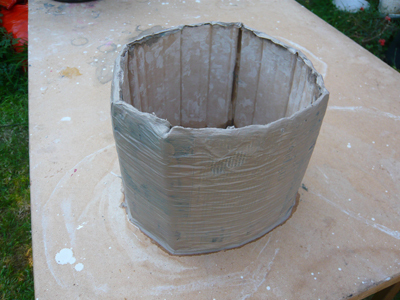 I am going to try my normal firing pattern and see what happens. 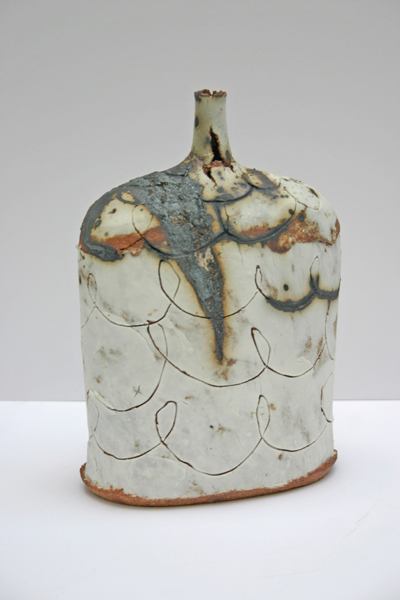 the only thought is that it will fire differently because the saggars block the heat from travelling around the kiln, so maybe a certain amount of soak is a good idea. but my very slow firng at the 1200 to 1300 stage should have the same effect as a soak. we got up very early this morning, it was so beautiful before six am. Tilda relocated her bedroom to the garden. this experiment didn’t work! by 2 am the burners had gone out, as the cardboard saggars disintegrated into them. this morning I opened up, found the parts of the saggars exposed to the flame all charred and therefore unusable, took the front top shelf out, whereupon smouldering sawdust and cardboard smoked and burst into flames and had to be doused with water. I will have to take the burners off to clean them out, and re-think. 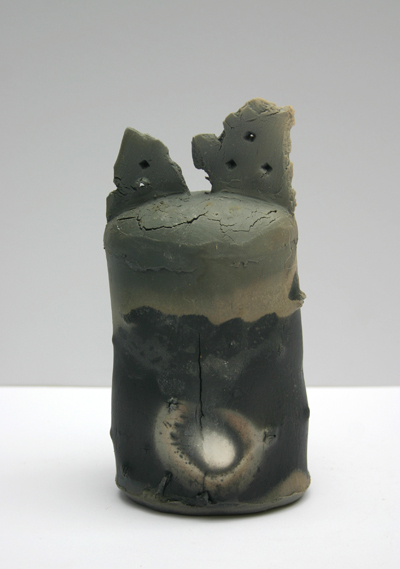 probably my kiln has the burner flame at too close quarters for the cardboard saggars to work and I will have to make or buy ceramic saggars; I am not sure if you can buy them actually. 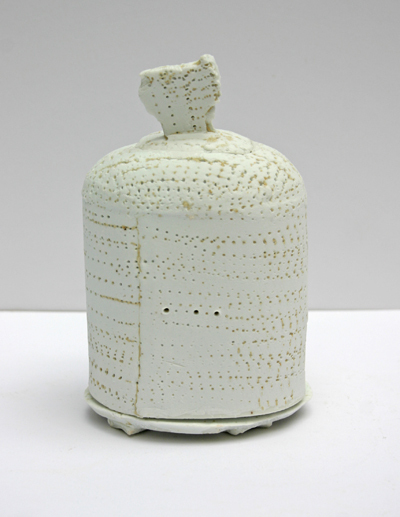 making is quite simple, but will require another biscuit firing and enough new work made to fill the kiln properly – ie the saggars themselves create a lot of wasted space unless they are filled up with more pieces. I am not too downcast, it was an interesting attempt, and needed to be tried out. art is all about play and experimentation. I will see if I can make a big saggar type box with kiln shelves and fire all this stuff inside that then finish off the pack with glazed pieces on top. purple was the first colour that my daughter took notice of, commenting that a friend’s grey yearling was a “purple horse” – he was, at that stage, a soft smokey dark purplish brownish grey. he did grow up to be a wonderful event horse, Ghosttown. first purple are the damsons that contributed so much to that cake. the trees are suckers that have grown up from the rather feeble victoria plum. 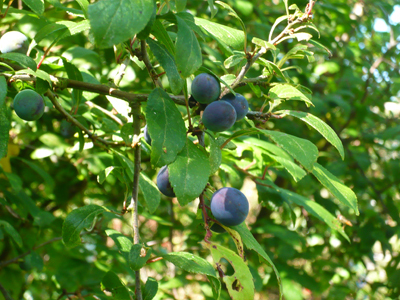 I much prefer the damson fruit to the plums, which are quite acid, and I usually get a good crop. not unrelated, sloes. I planted three blackthorn bushes for the early flowers, and this is the first year I have had fruit on them, after a wonderful show of blossom this spring, a bit later than usual. perhaps that’s why the pollination was more successful. but I don’t think I am going to be able to leave them on the tree until the first frosts; the ripe ones are already falling off. here’s hoping I can make some good sloe gin this year. I suppose I can just keep picking them up and saving them in the freezer (the alternative to waiting for the frost). cardoons, huge thistles competing with the hollyhocks in the tiny front garden. knapweed or hardheads, mostly over now but very attractive to bees and butterflies. dahlias, very easy to grow, and with climate change, no need to dig up the tubers and store them over the winter. even the relatively cold winter this year had no deleterious effect. 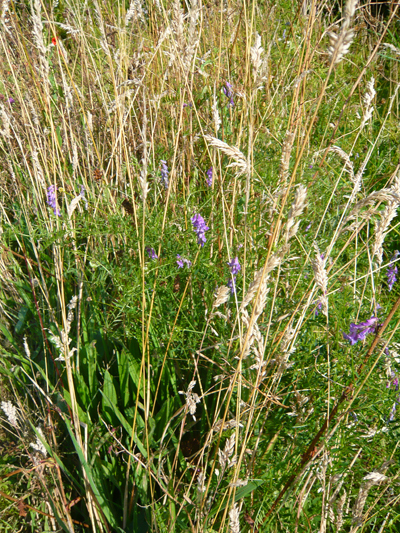 purple milk vetch, a native, likes calcareous soils and short grassland, was considered to help milk production as a grazing plant. 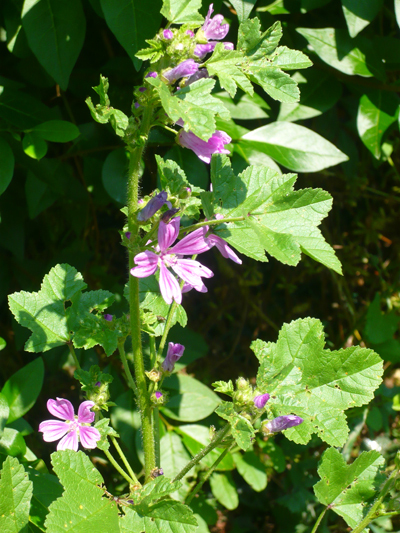 wild mallow, an enthusiastic climber, which tries to invade all parts of the garden and definitely gets too big for its boots. 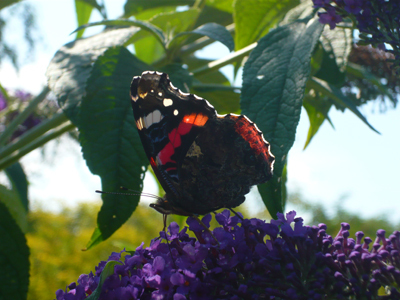 and the first red admiral I have seen this summer. I checked this out and discovered that they migrate north each spring, continuing through the summer, from North Africa and continental Europe. the immigrant females lay eggs and consequently there is an emergence of fresh butterflies, from about July onwards. 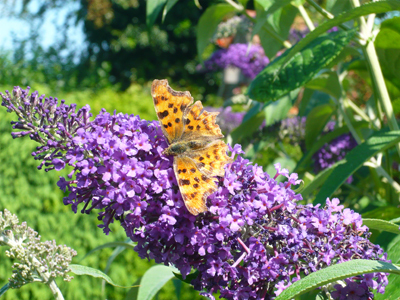 they continue flying into October or November and are typically seen nectaring on garden buddleias or flowering Ivy and on rotting fruit. 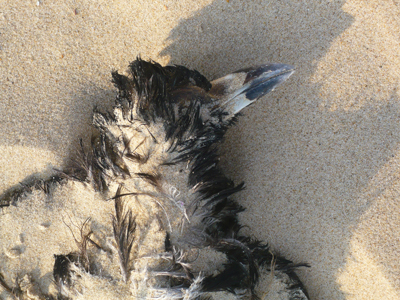 there is an indication that numbers have increased in recent years and that overwintering has occurred in the far south of England. 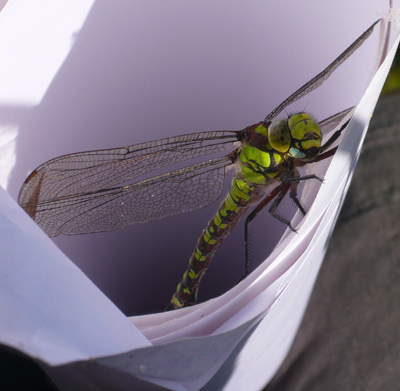 this dragonfly flew into my pottery workshop yesterday and was trapped under the glass skylight. he was very noisy in there, with his massive wings. I managed to scoop him up in a cone of rolled up paper. 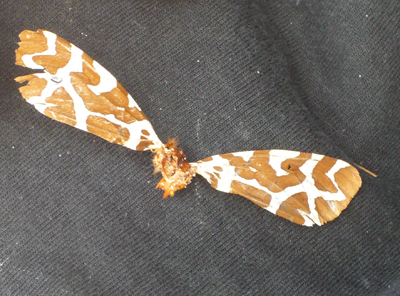 it took him five minutes to reorganise himself and fly away. these two large pieces drying in the sun are the last two pieces to go into the bisque firing, and the final throes of a very Lucy Rie influenced funnel top vase obsession. final only for the time being, however. yesterday was an adventure – spending the day stranded by the tide at Blakeney spit, arriving on the high tide first thing, and waiting for the next high tide before being able to sail back to the harbour creek. the tide was a biggish one (full moon) and by ten we were manoeuvring up the creek, past flooded saltmarsh banks in company with a few early seal trip boats in one Cockle, to save swimming to the second boat, whose mooring was drowned by the tide. no sails; unfortunately there wasn’t enough wind for sailing in the creeks and lagoon, and not enough water later when there was some wind. this time there would not be seal-boats full of people landing and wandering past our picnic. it’s not easy avoiding moored boats and sandbanks, even with the outboard. very quickly we are heading for the creek on the spit, following Miss Muppet in past the line of sticks in the mud which show the deeper channel. (this is so Arthur Ransom) although we discovered later, at low tide, that to sail in on the left of them is rather better than on the right, as we did this time, as they are on the right bank of the channel. but the tide was so high it didn’t matter. the creek is just around the corner from the usual landing place and offers a safer mooring for the boats. MM’s first mate waiting to help us tie up. the little beach here is drowned at ten-thirty am, and we paddle to unpack the picnic from MM. the saltmarsh around under water too; the creek looked like a lagoon reaching towards the seaward side of the spit. a recce is proposed to find the right place to spend the day, and we walk across the dunes, which are dotted with little wooden huts, slightly mysterious to us at this point, but during the day various people appeared from/around them, sunbathing, walking dogs, making trips to the beach, and we discover that they are privately owned, like beach huts. the spit is a nature reserve; the only way to get onto it except by boat is to walk from Cley or to wade across the mud, the channel and sand banks at low tide. after forty minutes or so the boats are high and dry, safe to leave for the day. we proceed to the almost empty beach fully laden and set up camp. magically clean and sparkling waves on a shallow shelving sandy beach have Elsie’s crew changed and in there almost immediately. 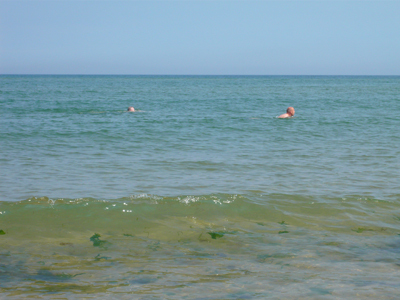 it takes longer for me to get in; twenty five years since I swam in the North Sea – but after a long paddle taking photos and getting my shorts wet I am persuaded. the water is refreshing, a bit of a cold sting to it, but pleasantly so. I see a small jellyfish and don’t stay in much longer after that. just a gentle swell. a seal pops up behind Elsie’s skipper; he doesn’t see it at all. coffee and cake satisfy hungry crews for the time being and we settle down to the sunday papers, keeping an eye on the tide and passing shipping. there are perhaps a hundred common and grey seals hauled up on stiffkey sand bar, lying on their backs with tails curled up in the air. this pretty old crab boat, Harvester, is out for the day; we see her coming in to her mooring much later in the evening, while we are waiting …..
a wonderful day for wandering about, beachcombing, trying to fish, in MM’s skipper’s case, unsuccessfully, or just lying there, and eating of course. the high tide mark turns out to consist mostly of millions of dead ladybirds, those of the huge influx over the past week or so which didn’t fly quite far enough. 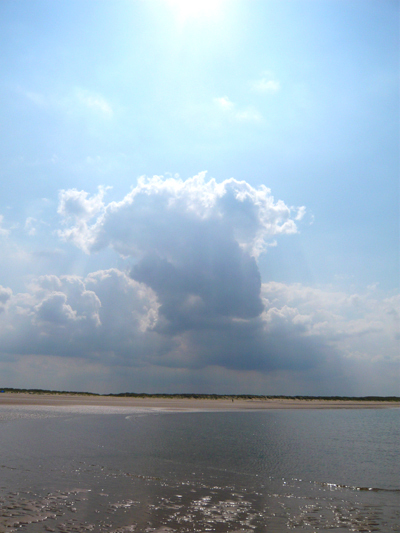 huge dark clouds shadow the land and from time to time shade us, but out to sea the sky remains that shimmering blue. the retreating tide exposes a wreck, marked by a cardinal point, apparently a fishing boat. the water level goes down another six feet or so below this at low tide. eventually we have a very carnivorous lunch cooked on disposable barbecues, sending smoke up the beach in a fairly antisocial manner; huge lamb chops and mackerel fillets, deboned and frizzled; these are declared the best thing any of us have eaten. it certainly beats cooking mackerel indoors where the stink of burnt fish oil lingers for days. we are sitting in-between sea-rocket plants, which rely on the tide to disperse their seeds but evidently use the landplant’s reliable pollinators, and some sort of low prickly green plant. the wind, although not unpleasant, continues to blow all day, leaving tiny dunes behind stones or any other object, which gets buried or undermined, depending on its shape. and others of differing qualities, emerge from the sand. we wait for the tide to come back in. the boats are still very high and dry at seven pm; we wait another hour, watching the tide creep up the deeper gravel-bottomed zigzag channel of the creek. a parade of boats comes up the main channel; the big sailing barge Juno, turning around into her mooring; Harvester towing a lighter; a raucous fishing boat playing some very loud music, smaller sailing boats and a couple of motor cruisers. people are out late water-skiing, catching the tide with the last of the daylight. at last the water is rushing through into the beach lagoon below our boats. it’s quite cold now and we want to be able to get into the moorings before dark. between us we manhandle Elsie and MM, turning them around and pushing them down into the water. they are heavier than you would think and it is only just manageable between the five of us. motoring back with the tide, the light is beautiful; too dark for my camera. we are home after dark. today I woke dehydrated and tired, feeling like a crisp-fried prune. but what a wonderful day! olive oil and yoghurt cake with damsons and dark chocolate, adapted from Ottolenghi’s apple and olive oil cake. 1 grease and line 20cm springform cake tin with baking parchment. 3 mix oil and sugar in a fresh bowl. add the seeds of the vanilla pod. gradually add the lightly beaten eggs; the mix should be smooth and thick. add the damsons, yogurt, and chocolate, then lightly fold in the dry ingredients. 4 whisk the egg whites in a clean bowl until they have a meringue consistency. fold them into the batter in 2 additions. (Try to lose as little air as possible). 5 pour the batter into the lined tin, add a topping of toasted pumpkin seeds and place in the oven. bake for 1 1/2 hours or until a skewer inserted in the centre comes out clean. remove from the oven and leave to cool in the tin. this adaptation of the recipe rose beautifully. the damsons turned a rosy red colour, and the cake was brownish. I was tempted to cut it and add a filling of yoghurt, but on the beach it would not have been a good idea. an early walk this morning at seven. beautiful satin blue and rippled white sky looking west, and overhead. although this walk is all on tarmac and its a march nearly all the way to the next village and march back again, with T on the lead, type of hike, I love it for the views. the road swoops up and down; from the highest point there are glimpses of the sea, and coastal villages, misty today, the sea a mere smudge of hazy grey blue. a small valley begins here, water running off the gravel ridge, and makes a crease in the landscape, holding patches of ragged woodland and wet grassland between the fields of barley and wheat. I often see the roe deer from the shelter of these hedges, and the blackberrying is fantastic. everything has been trimmed back recently, there are no wild flowers to speak of; but I did see a yellowhammer yesterday. big ash and oak trees stand in the hedgerows. the verges are wide – plenty of room to avoid the quite frequent cars – and yesterday a huge lorry. this morning Tilda caught a rabbit with myxomatosis; luckily she had it by the neck and killed it quickly. there is a plague of rabbits at the moment, I suppose the disease is encouraged by overpopulation. I did a count today of red things in the garden; field poppies – uncountable. so perhaps groups of red things would be better. white bryony berries. this is a member of the tropical gourd family, the only British one, and all parts of it are poisonous. after an aphid infested spring, suddenly there are huge influxes of ladybirds, migrating from Europe. also masses of lacewings and hey presto, no greenfly.